APiF: Please introduce yourself: who are you and what do you do? Osborne Macharia: I am Osborne Macharia, a self taught commercial artist born, bred and raised in Nairobi, Kenya. I can describe myself as a commercial photographer by day and Afrofictionist by night, creating works of art that show a different positive side of home and Africa in general than what we see. APiF: I saw you described as “AfroFuturist” and your art as “Afrofictionism” – What is Afrofictionism? Osborne: Afrofictionism is basically independent narrative style of photography which highlights three key principles being Culture, Fiction and Identity through storytelling that borders between reality and fantasy. Through social inclusion, it creates a powerful platform to convey important messages on topics such as Gender Discrimination, Ivory Poaching, FGM, Albinism, Dwarfism, Minority groups and care for the elderly. I find that fiction best tells these stories as you have no restrictions in terms of your imagination. You can create characters and make them as mighty as you want them to be as opposed to how society has perceived them. Osborne: My heritage and culture is one of the guiding principles behind my work together with identity and fiction. Things I have seen or stories I have heard while growing up influence my art and how I present it to the world. It’s all about changing negative stereotypes and the famous clause ‘This Is Africa’ into ‘This Is My Africa’. A more personal interpretation of how you want the world to perceive and see Africa as compared to what Western media keeps showing. APiF: Magadi is your latest project – what is it about? Osborne: A fictional story inspired by my mum and the work she did a while back which was advocating for the end of Female Genital Mutilation (FGM). 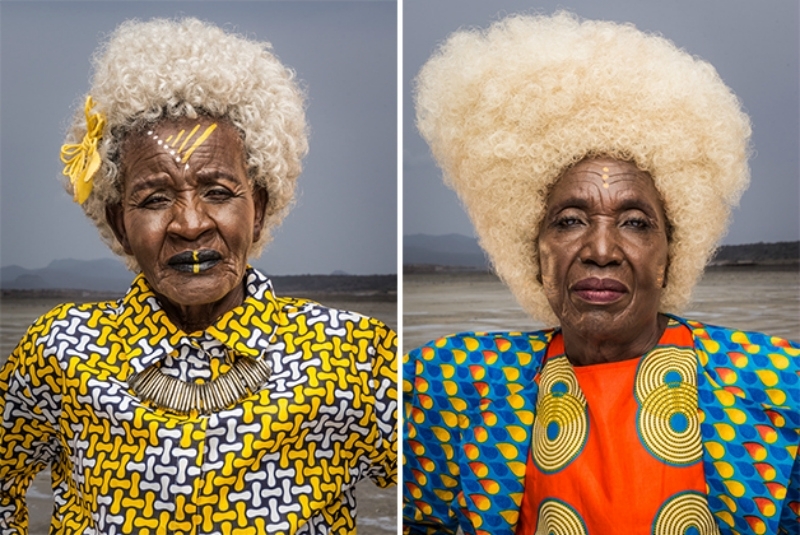 The women on the images are group of former female circumcisers living in the vast salty plains of Lake Magadi who abandoned their former practice and took up ethnic fashion as an alternative livelihood. They now shelter young girls teaching them on fashion skills such as styling, design, print work and modeling for both local and international runways. Initially I didn’t think of this story, but rather wanted to shoot the women in colored prints in a vast dry place looking very glamorous. After I had a talk with my mum on the topic of FGM and if it was still relevant today, and from her feedback I knew this was the direction I was going to take. We launched the project during Design Indaba 2017 where I had been invited to speak. APiF: Any tips on how to become an AfroFictionist / AfroFuturist? Osborne: Afrofictionism is all about storytelling either visually, through music or writing that has an element of fiction in it. It has to project the future, Africa’s future from a higher point of view. No talk of poverty, war, disease or conflict but rather an appreciation of our culture, heritage and traditions, fashion art and so on. It’s Africa as we know it.